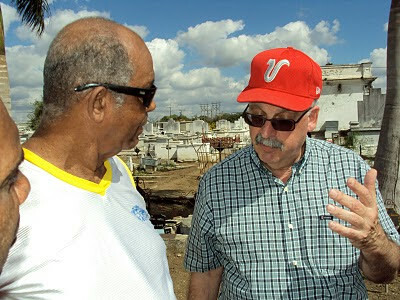 Martin Dihigo Jr. (left) and Kit Krieger discuss baseball at the gravesite of Dihigo's father in the cemetery at Cruces, Cuba. CENTRE: Martin Dihigo was known as The Maestro and the Immortal. 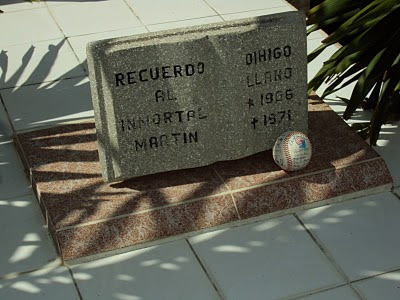 BELOW: Every year, Krieger leaves a baseball signed by his tour group on Martin Dihigo's grave. The museum in this town has on display leg irons and shackles used to imprison slaves who worked on the surrounding sugar-cane fields in colonial days. Another room, facing onto the town square, presents happier artifacts expressing freedom in a land in which such a quality has always been in short supply — a passport, a leather glove, a photograph of a young son on the knee of a father wearing baseball flannels. The boy is aged 67 now, his pear-shaped physique barely hinting at the professional athlete he had been. To Martin Dihigo Jr. has fallen the responsibility for bearing witness to his father’s athletic greatness. The Dihigo name (pronounced DEE-go) remains revered in Cuba, where the father, once known as El Maestro, is remembered as The Immortal. His bust can be found beneath the grandstand at the Estadio Latinoamericano in Havana. Many baseball historians regard the elder Dihigo as the most versatile athlete ever to take the field, capable of playing the infield as well as the outfield, even while being highly regarded as a pitcher. He was a demon on the mound and a terror at the plate. A group of 25 baseball fans from the north, led by Kit Krieger of Vancouver's Cubaball Tours, made a detour to Cruces to honour the Immortal’s memory and to pay homage to his legacy. Eleven of the tourists hailed from British Columbia, counting among themselves a tax lawyer, a publicist, a journalist, a cartoonist, a travel agent, a corporate headhunter, a stay-at-home dad, two retired teachers, and a provincial court judge. The northerners were English-speaking whites from a wealthy land come to pay homage to the son of a black-skinned, Spanish-speaking man denied the opportunity to ply his trade in baseball’s major leagues owing to the colour of his skin. The touring group crowded into the museum room. The senior Dihigo has been called “the black Babe Ruth,” though the record suggests Ruth be described as the “white Martin Dihigo.” In 24 stellar seasons, the Immortal hit for power and average, winning twice as many games as a pitcher as he lost. He retired in 1947, the year in which Jackie Robinson at long last breached the colour barrier. Had Dihigo not been barred from the majors, he would have been as celebrated as Ruth, with whom he shares the honour of having been inducted into the famed Baseball Hall of Fame at Cooperstown, N.Y. Dihigo has also been enshrined in the Cuban, Mexican, and Venezuelan halls of fame. His reputation in Cuba is all the greater for his brave opposition to two tyrannical presidents. 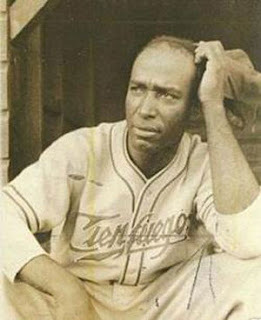 The ball player opposed the dictatorship of Gerardo Machado in the 1930s. In 1953, by which time he had become a prominent sports writer and announcer, he left Cuba vowing not to return until Fulgencio Batista was overthrown. While living in self-imposed exile in Mexico, it is said he donated money to Fidel Castro's movement after Che Guevara made a personal plea for funds. After the 1959 revolution, he returned to his homeland ever more a hero. That he never broke with Fidel Castro means the regime has a continuing interest in promoting his legacy. Dihigo died at Cienfuegos in 1971, five days before what would have been his 65th birthday. The death received scant notice in the United States. In Mexico, every baseball park held a minute of silence in his honour. In Cuba, his passing was mourned throughout the land and his achievements were lauded in public ceremonies. His namesake son tried to follow in his cleats. Marty Dihigo, as he was styled by sportswriters, never came close to his father’s brilliance. His greatest performance came in smacking seven consecutive base hits with the minor-league Geneva (N.Y.) Redlegs in 1959. When playing for teams in Palatka, Fla., and Macon, Ga., he sometimes had to stay in his car while teammates ate in whites-only diners. He returned to his homeland and his father’s shadow. “It is really difficult to have the same name as Martin Dihigo and to play baseball,” the son once told me. “Everyone thought that because we had the same name I had to be as good as he was and I had to do what he could do. As he does on every annual visit, Krieger placed on the grave a baseball signed by each member of the tour group. The visitors brought a sack of baseballs for local children. Dihigo received as a gift a package of dried B.C. salmon. He had a request for next year’s visit. He would like a pair of athletic shoes, perhaps Nike, size 10 1/2, the supply of such limited on the island. The Dihigo pilgrimage is a reminder that an athlete’s glory lingers long after their departure.